My current book project is Breed of Heroes: Inside the Howe Dynasty. This will be the first history of the eighteenth-century Howe family, whose sons were joint commanders-in-chief of the British military and naval forces during the first three years of the American War of Independence. The family biography will span four wars and almost a hundred years, but the focus will be on the most controversial period between 1776-1778 when the Howe brothers served together in America. By telling the story of the British side of the American Revolution through the experiences of this celebrated military family - not only the famous brothers, Richard Admiral Lord Howe and General Sir William Howe, but their wives, Lady Mary Howe and Lady Frances Howe, their sister the Hon. Caroline Howe, and their mother, the Dowager Lady Howe - Breed of Heroes will provide the human perspective on the war that until now has been the sole preserve of American First Families such as the Jeffersons, the Washingtons, and the Adamses. In uncovering the private history of the Howe dynasty, it will also shed new light on the careers of Richard Admiral Lord Howe and General Sir William Howe, and on their motives in accepting command of the British army and navy in 1775-1778. For almost a century, the Howe dynasty has been labeled ‘mysterious’ by historians relying on well-known military collections. My book will use neglected material in the British Library and elsewhere for its new, family-based approach. I am under contract with the Liveright Publishing Corporation, W.W. Norton and Company. 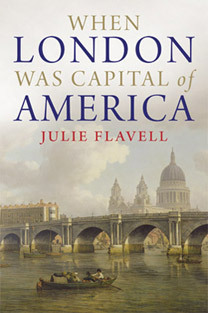 In this unique book, Julie Flavell brings to life a missing chapter of London's history when it was the centre of an empire that stretched from North America to the West Indies and Africa. Set in the momentous years just before American independence, When London Was Capital of America interweaves the stories of colonial American visitors to the city with the forgotten American features of Georgian London. Despite the conflict over colonial rights, London was experiencing its first big wave of American visitors. No innocents abroad, the individuals whose stories are told here - an enterprising house slave from South Carolina, Ben Franklin in search of a second career, a plantation owner and his rebellious son, a Yankee merchant who almost became Lord Mayor, and a southern belle who found herself an unwed mother - vividly recreate a time when Americans saw London as their own, and London's world view was being challenged by the influx of its exotic and multiracial fellow subjects from the New World. When London Was Capital of America reminds us of the complex, multiracial - at times even decadent - nature of America's colonial British heritage. Nine leading historians of the new military history offer a fresh look at a critical period in the history of the Atlantic world. 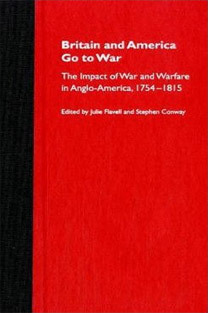 In a series of essays they examine the three major North American conflicts that disrupted the British Empire between 1754 and 1815: the Seven Years' War, the American Revolution, and the War of 1812. Taken together, these wars helped to define the identity of each nation while transforming the entire English-speaking world. The essays in this collection explore the social and cultural impact of the three wars, while presenting them as part of a continuous struggle among Native Indians, Europeans, and colonists for control of North America, and the emergence of a new international order.